Free, easy-to-use text reader! IVONA Text-To-Speech converts the text on your PC into natural-sounding spoken words. Simply make your selection to listen to news, articles, documents, RSS feeds, e-books, web pages, emails, and much more. Depending on your needs and preferences, you can easily adjust both the speed and volume of the voice. IVONA MiniReader is compatible with all IVONA Text-To-Speech voices and other SAPI 5 standard TTS voices. Free text reader! Let Text-To-Speech read the text on your PC out loud! ...... compact, easy-to-navigate miniaturized interface. texts on web pages, emails, e-zines and newsletters, articles, and text documents in Microsoft Word, OpenOffice and Adobe Reader formats. - Using the system's tray menu shortcut. - click the Play button (or hot key CTRL+SHIFT+Space). 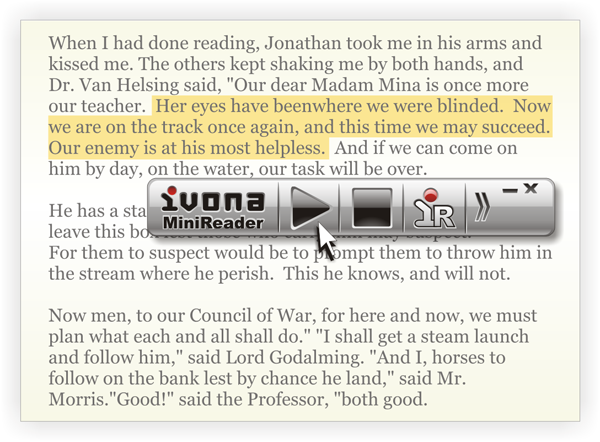 IVONA MiniReader has two interface modes: full and mini. You can switch between the two modes by clicking the Show and Hide buttons. Qweas is providing links to IVONA MiniReader 1.0.6 as a courtesy, and makes no representations regarding IVONA MiniReader or any other applications or any information related thereto. Any questions, complaints or claims regarding this application IVONA MiniReader 1.0.6 must be directed to the appropriate software vendor. You may click the publisher link of IVONA MiniReader on the top of this page to get more details about the vendor.